Marvel has been reigning supreme in the “comics on film” game for years now. With their latest film announcement DC appears to have a game plan for being a major contender in the game again. Still Marvel stole all of their buzz with their own major announcement. DC has the more recognizable characters but Marvel has won minds through innovation, marketing, and synergy. Now, it appears that DC is looking to change that paradigm. A big announcement came from Warner Bros.’s comic department, confirming that 10 DC films will be hitting screens between 2016 and 2020. With that announcement, DC Comics is finally getting a proper film universe much like Marvel has established since Iron Man back in 2008. Finally, the Justice League and its most common members will (presumably) be given a proper film treatment. It really is a brilliant plan: let Marvel do the hard work of priming moviegoers for cinematic universes, and then charging ahead with a plan that releases 10 films in 4 years. Whereas Marvel built their universe over time, DC now has the luxury of pushing it all out in a cohesive thrust (prior misfires aside). In addition, the rights to some of the Marvel properties have been sold to other studios, making it nearly impossible to create a full fledged universe of its characters. Sony has the rights to Spider-Man. 20th Century Fox has the rights for the X-Men and the Fantastic 4. But for DC Comics, Warner Bros. is the one stop shop. This is the biggest and most important advantage that DC has over Marvel. On the flip side, Marvel is more established, having the time and experience to work out all of the kinks in the film universe building process, and DC must compete head to head while starting from behind. 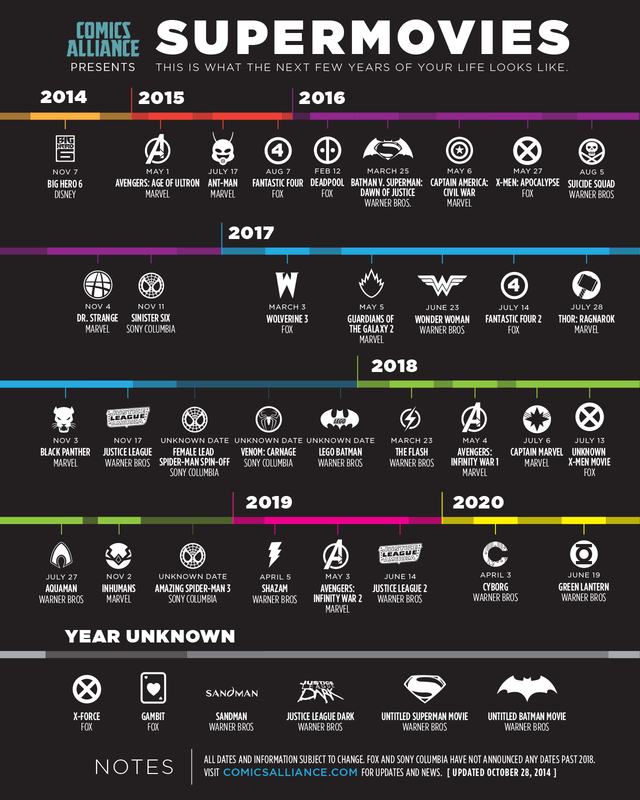 Just look at the landscape of comic book movies from now until 2020. It is incredibly crowded. If you look deeper, this is a quite historic moment. Outside of the rivalry, both camps are breaking new ground by releasing films led by an African American and a female superhero. Outside of film, television has also become a cultivating ground for comic book characters. DC has a long storied relationship with television; its highly recognizable characters have been easy transplants to the medium, and a number of shows have had successful runs. But this is where DC has squandered a huge opportunity. The studio never bothered to create these characters inside of one universe. These shows have not taken advantage of the power synergy, and they need to fight to win over viewers with each new iteration. If DC had taken another route, there would have been a solid platform for its film universe to springboard from. Even now, Warner Bros. has seemingly not learned this lesson. With the varies success of Arrow, The Flash, Gotham and the newly premiered Constantine as well as a planned live-action version of Static Shock, none of these shows link with the movies they are creating. Marvel had moved in the other direction with its film properties feeding into new television opportunities. Marvel’s Agents of S.H.I.E.L.D., despite its struggles, spun directly out of The Avengers and has a built-in fan base. They also have a bunch of new series coming to Netflix in 2015 that will follow Daredevil, Luke Cage, Iron Fist, and Jessica Jones. Once each series has its run, their will be another, The Defenders, that will chronicle their adventures as a team. All of this is very complicated, but nothing underscores the state of the comic book film battle than the recently released The Avengers: Age of Ultron trailer and footage. And that, my friends, is how you do it. That is how you make comic book magic on the silver screen. And no matter how good you think Man of Steel or any of these new DC films may be, I don’t see them holding a candle to what Marvel has and is continuing to accomplish.